Mix custard powder in a bowl with 1/4 cup milk. Mix till there is no lumps.Add rest of milk, stirring well.Then add yogurt, condensed milk & essence. Pour caramel on a cake mould. Coat on all sides & set that aside. Then pour the custard mixture on it. Put the mould in a preheated cooker. Close the lid without putting whistle on it. Cook for 15-18 mins on a very low flame. After 15 mins, take out & allow it to cool a bit. Now release the sides with a knife and place a plate over the mould. Holding the mould carefully, invert it. Now tap the top of the mould carefully and lift it for a lovely caramel custard. Custard powder can be homemade / bought from store. When you pour the custard mixture over the caramel, it may look like mixing all. But later, the caramel will settle in the bottom. ​​It may look giggly when u take out after done, but it will set as it cools. Taste will be enhanced more if refrigerated. 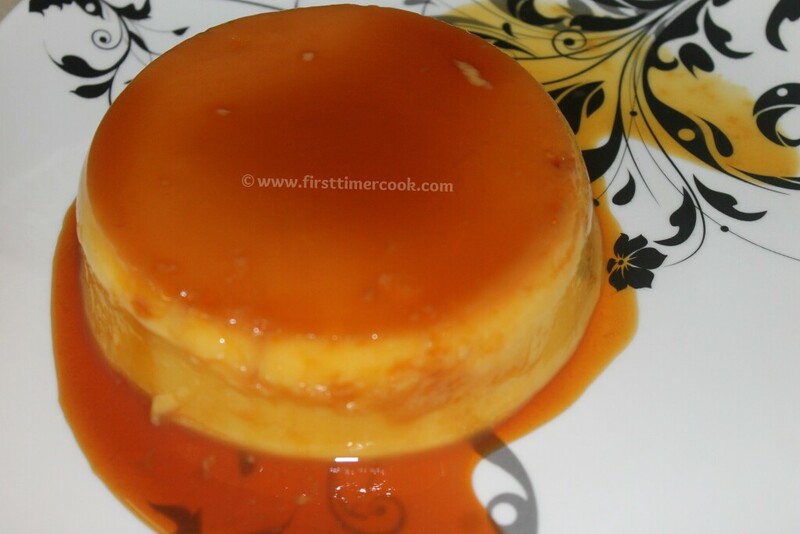 Caramel part can be omitted & then it'll give plain vanilla custard. This recipe can be done in a microwave (Baked Caramel Custard Pudding).